In case you did not know, Louisiana is switching from their green/white shield design to the more conventional black/white. Recent trips to the state over the last two months revealed that they are popping up all over. The first ones we saw were in Bogalusa at the junction of LA 10/23. 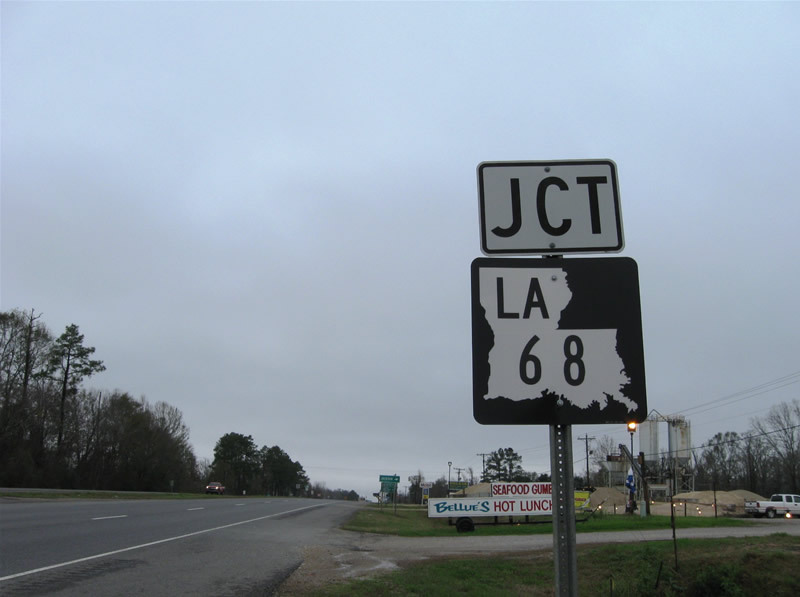 This particular assembly is located along U.S. 61 northbound in East Feliciana Parish. 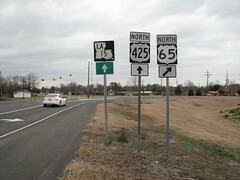 All of those ones we saw posted along U.S. 61 earlier this month featured Series B font too. Cheaper printing costs I'm assuming? a two-color print would cost the same regardless of color, so that's probably not it. I think they're going for the better contrast. guess using something wider than Series B numbers never occurred to them! Perhaps George Washington Carver, then? I saw quite a few green shields with black/white banners and/or arrows on my recent trip to LA. That's been SOP for a few years now, even before they started going to Monochrome shields. probably, yeah. Now that I think about it, I have a hard time telling apart digit "1" in various serieses... but I definitely have taken a photo of that gantry. Only other place I can think of with an assembly like that is Public Square in Cleveland. The black and white shields, according to the e-mail sent me by DOTD, are cheaper to manufacture since black coloring is less expensive than green coloring. The unique green/white signs will surely be missed, but I do admit that the monochromes are an improvement in terms of readability. 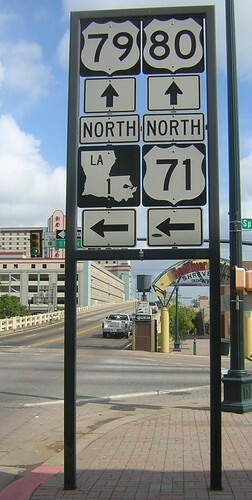 If DOTD would only use wider fonts for the route numbers, the signs wouldn't be nearly as ridiculously ugly. Series B is only necessary for 4 digit routes. black coloring is less expensive than green coloring. well I'll be damned. I've always gotten the same quotes on two-color shields regardless of the colors. Apparently for higher volumes it becomes an issue. also, what does DOTD stand for? I refuse to believe it is Department of Transportation Department. Department of Transportation and Development. I think "development" is a reference to the other public works responsibilities the agency has. Louisiana always has to be different, y'know. Would you believe that I live within eyeshot of their HQ here in BR? Used to be Louisiana Department of Highways until the Dave Treen administration consolidated the government agencies around 1982 or so. Mostly, it's a overture to economic development than anything else. Please lob a brick through one of their windows for me over all the useless 4dla's in St. Tammany, will you please? The La DOTD is even involved w/ railroads, and not just grade crossings. Last week, we took some Louisiana politicians (or their aides) at all levels of gov't, a man from the DOTD, and a few others on a ride on my railroad that runs in Louisiana (37 miles to the Arkansas state line). We were trying to show them that we needed some stimulus money to rebuild our track. The DOTD had written up a plan 5 years ago addressing the needs of some of Louisiana's shortline RRs. I didn't even know that they were that involved w/ any other mode of transport other than highways... now I know!! I hate we're going black n white instead of green n white. But y'all r right... it's better than circles, squares or anything else generic. Louisiana introduces GeauxPass for statewide toll collection system! Re: Louisiana introduces GeauxPass for statewide toll collection system! They might as well incorporate GeauxPass into the CCC and LPC. The article says it will be "compatible" so I'm assuming they plan on keeping the 3 seperate systems in place. They are supposed to be completely rebuilding the CCC toll system soon so they might as well just make it all one system state-wide. It would be nice if CCCD and HCTRA could reach an agreement and make toll-tags from Houston and NO inter-operable. How about more toll roads in LA? What does "geaux" actually mean? It sounds French. Is it French for "geek"? Is the proposed BR Loop supposed to be a toll? -eaux makes the same sound as O. So it's GoPass. Like Geaux LSU/Hornets/Vote, Club Lotteaux, etc.